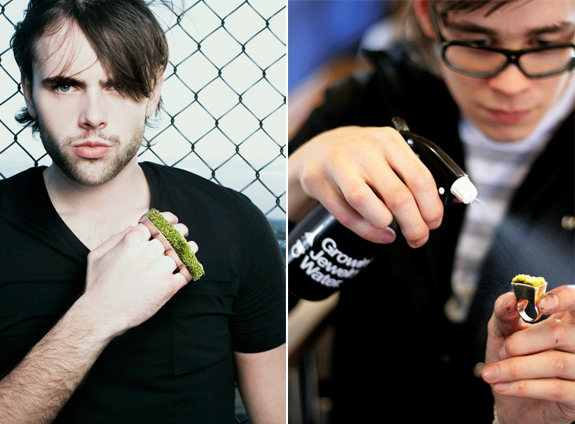 With the rings from the Growing Jewelry collection you’ll need a green thumb to keep green on your finger. 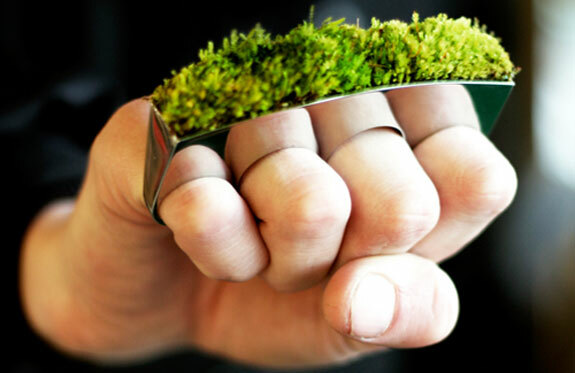 That’s because Growing Jewelry rings, handcrafted by Iceland-based designer Hafsteinn Juliusson, are topped with real living Icelandic moss! For men there are two wide, intimidating knuckle rings to choose from—one goes across two fingers (250€), the other across four (350€, see pic below). Both are perfect for the organic gardener-gangsta. The Growing Jewelry rings for women are of the single finger “only” variety, making them a more demure fashion statement. Choose between a round (€150) and square (€170) design. Growing Jewelry is available at the Reykjavik Art Museum, where it is displayed on sand beds beneath growing lamps. 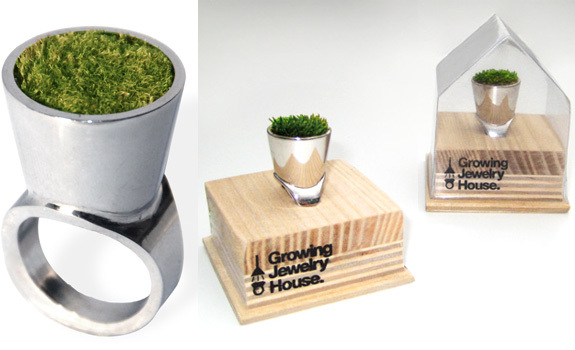 The rings are also sold through Juliusson’s online store and are shipped out to customers in a sort of miniature greenhouse. 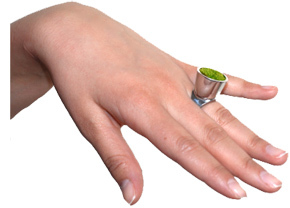 The moss atop of each Growing Jewelry ring must be tended to with water, nutrients and light like any other plant. Care for your ring properly and it should last for at least three months. Ourselves, we can’t wait for Juliusson to design working miniature 14K gold lawn mowers to accompany this collection. Yes, rumor has it that their “Growing Jewelry Water” is specially formulated to contain two parts hydrogen and one part oxygen.